Sometimes you really can tell a book, or an album, by its cover. 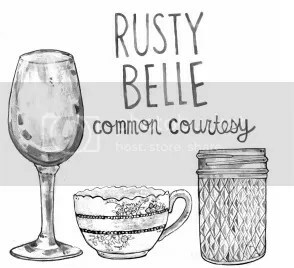 Something about the strikingly simplistic charcoal sketches on white cover of Rusty Belle’s Common Courtesy (as well as the band’s name and album title) told me I’d like it and I really do. Rusty Belle’s press release describes them as a “rock trio,” but their multi-genre, multi-instrumental style runs the gamut from Americana and folk to rock, soul and blues. The third album by the New England sibling trio, Common Courtesy, will be released on Rusty Belle’s own label, Whistle Pig Records, on September 10th. Singer Kate Lorenz’ hushed, husky vocal on the quietly captivating opener “Sad Little Boys” reminds me of Holly Cole’s brilliant tribute to Tom Waits, Temptation. Maybe later I’ll let me smile. The first single, “Change My Heart,” takes a drastic turn in style, upping the tempo and energy with some electric guitar. You can watch the awesome ’80s-inspired video for the song below. If I didn’t love these guys before, I sure do after seeing their retro dance aerobic moves. “Anything” is a bluesy, sparse, soul-rock ballad, and the darker rock track “Devil in Your Smile” has delicious shades of Nick Cave.